Athens, GA (May 1, 2008) - Friend and colleague Rocky Oliver turned me on to this incredible story of sportsmanship and respect out of Western Oregon University, A Division II school. With two runners on base and a strike against her, Sara Tucholsky of Western Oregon University uncorked her best swing and did something she had never done, in high school or college. Her first home run cleared the center-field fence. 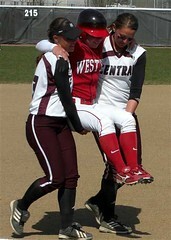 Then, members of the Central Washington University softball team stunned spectators by carrying Tucholsky around the bases Saturday so the three-run homer would count - an act that contributed to their own elimination from the playoffs. "With so many athletes having a "me first" attitude, there really aren't many great role models left. These girls are the very definition of good sportsmanship and good role models." I will go further. If these young women are not recognized in the next edition of the ESPY's or considered for selection as Sports Illustrated Sportswomen of the Year, then our sense of values and the importance of athletes as role models is seriously twisted. I passed this along to a baseball coordinating producer I know at ESPN. He wrote back when I asked if he had seen this clip and here is his response, "I sure did; in fact, in our meetings last week, we were discussing how we could cover this in our games (sportscenter covered it prominently). Very cool story."